Your article regarding your visit with Mary Paloumpis was very interesting! It brought to mind the special experience I had as a child of being able to attend her wedding in Peoria with my sister and parents. It made such an impression on me since it was so beautiful and different from any I had previously, or since, attended. Thanks for all of your good work on "Minonk Talk". The MDR Class of 1983 will be holding their 20 year class reunion on November 1, 2003 at Alexander's Steak House in Bloomington, IL. Cocktails at 5:00 and begin cooking at 5:30pm. We have not found addresses for Karen Schneider or Chuck Lynch as of 10-21-03. If you know their address, please contact Dawn Gaspardo at dgaspardo@flanagan.k12.il.us as soon as possible. There are at least 21 classmates planning to attend at this time. I am a 20 year resident, avid volunteer, and a Alderman to this community and there are some things that I would like to voice my opinion about. I just want to first state that these are my opinions and mine alone. I have noticed over the past year that the moral in our community is way down and getting worse. I believe there are several reasons for that which I would like to voice my opinions about. 1.) The School districts financial problems and cutting extra curricular. This has been well publicized on this website and in local papers along with strong opinions about the issue. I for one, am a big supporter of extra curricular and sports in general. I played Football and went to all the Basketball & Baseball games when I was in High School. I now volunteer my time to coach Junior Football in the fall and help the High School program out when needed. Whether anyone in this community wants to admit it or not, extra curricular is part of education and growth as a person. Without that extra activity outside the classroom, what you have is kids feeling trapped, bored and no chance to socialize and express themselves. Also, not to mention the feeling of accomplishing something as a team, sportsmanship, strict discipline and hopefully respect for other players they are playing against. The most important thing sports in general brings to the table is teamwork ethic. Anyone who works in a somewhat big company would know that you have to know how to work in a team environment. That is how the industry is today. You work as a team not as individuals. I am sorry but you just can not get all that in a class room 6 hours a day 5 days a week with your head in the books. Don't get me wrong, I also think the class work, homework, and the true basics Reading, Writing and Arithmetic are very important and if not more important. However eliminating one throws off the balance of well rounded young individuals. With all that said I feel as if the Committee that was formed by the School Council has a real tall task ahead of it but I am certain they will be able to succeed with idea's from the community. Some of the idea's I have voiced to several people is to come up with Organizations for the different extra curricular. Our JFL program is a non-profit organization that is very successful and one of the best in Central Illinois. The question I posed is run a Fall Sports Organization, Winter Sports Organization and a Spring Sports Organization. Each ran separately and each funds its own sports and other extra curricular. What I don't know at this point is if the IHSA can recognize these sports if ran from a separate non-profit organization other than the school. Another idea I have voiced is to hold a Casino Night or something along that lines that can raise money for extra curricular. After talking with different people that have ran this kind of event it raises quit a bit of money. One thing that is certain and I feel strongly about it is that everyone in the school district especially Minonk need to ban together to get through this hard time. Rather than point fingers, blame certain people and complain about the past start offering solutions, donate time, money, or whatever to help the cause. 2.) My second concern involves just Minonk. I feel as if people in Minonk are so quick to complain about things, start controversy, or just not care about our town. My personal feeling is I love Minonk. I think it is a great community. I want to raise my (soon to be) kids here. That is why I am so involved with things within the town. It troubles me that over the past year I have seen more and more houses for sale in town. Two years ago you couldn't find a house for sale. Now I think I counted at one time around 35 houses for sale. If that is not a good sign of a community in trouble, I don't know what is. I have a few idea's of what is causing this. I am sure that the school's financial problems and cutting of extra curricular are a few big ones. Some people feel that there is not enough things offered in Minonk. In which I feel this is changing with the development of the Millennium Park, Suttons Park, and a future Miner's Trail going through town. I also strongly feel that people really don't feel any Pride in our town. Volunteerism is down and no one supports events that are put on in town or help with them. I knew by being on the 4th Of July Committee that we are in serious need of volunteers. We have a steady 9 or 10 person committee. Believe me, that is not enough to run a very successful event. It could be 10 times better every year if we had the help and support of the community. This would bring people into our town and then they could see what a nice community we have in Minonk. Same goes for all the other volunteerism that goes on from the Ambulance squad to the weekend help at the Parks with the construction that is going on in both areas. I just think more people need to become more involved within the community and make things better rather than finding things that are wrong with it and complaining about it. 3.) The third thing and last of my ramblings is I am concerned about publicizing problems in Minonk before they can be addressed. This is not a dig at this website in general it is for the community as a whole and all media outlets. I just wish if a concerned citizen has a problem or see something that should be addressed by the City it should be brought to there attention first so it can be addressed quickly and appropriately. The negative publicity is one of the worst things if we want people moving into a nice community. If they see all of this complaining and problems that need to be addressed who would want to move here. I am all for freedom of speech so I don't want anyone thinking I am not. I just think if there is a problem it needs to be escalated and delt with first and if anything is not done about it then it is fair game. That is just my take on it. I am just tired of people saying things such as "Toluca has no problems putting on a celebration." or "El Paso is a nice community and they have so much to offer.". You know what the difference is. Those communities have support from the businesses to the individuals that live in the communities. They take Pride in there Community and School. Everyone supports one another. I don't want to see the individuals that I know that are in there mid 20's to early 30's move out of town to the El Paso's or Bloomington- Normal's and leave where they grew up just because of no pride in the community or no support for the school. Without these people the community is dead in the water. I know my wife and I don't want to live in those communities I want to live in Minonk. I feel as if we have the individuals and businesses that can make this town into what it should be. I just got home from a business trip and read your editorial on the vandalism of the trees in the parking lot. Though I no longer live in Minonk and have not seen the damage first-hand, I feel the first thing I should say is that I am sorry. It is apparent to me that your attempt to beautify the city through a lasting memorial to your mother is neither appreciated nor respected by the people of Minonk. I intentionally say "people" in the broad sense of the word to include not only the barbaric youth that have perpetrated the crimes of vandalism, but also their irresponsible parents that have raised these amoral vandals. There is no reasoning with children who have probably never been taught better, likewise, it is futile to reason with parents that would be so irresponsible themselves as to raise children of this caliber. People like that don't deserve the benefits of your efforts. Don't give these ignorant people another chance to prove their mettle - move the trees to a safe location before you lose all of them permanently. Editor's note: Unfortunately, the trees are too big to move now. This letter is in response to Mr. Rodseth's letter about the Minonk ambulance service. I, being an E.M.T. on the Minonk squad many years ago agree with Chris Jenkins comments. The squad is a volunteer squad, and sometimes the people on call do not live accross the street from the shed. Most of them live across town from shed. And a lot of members have children to find places for them to go when pagers go off! My mother served on the squad for many, many years when I was little. I remember times that I was pulled out of bed in middle of night so she could answer to the call. She always seem to have it worked out to where I would go to a neighbors house so it was quicker for her to get to the ambulance shed. But there were times you would get the "ignorant" driver in front of you that just would not get out of the way so you could proceed to the shed. Then there were times we were short handed and would run with 2 a lot of times. But you know that call got answered. There are a number of things you could do to help this situation, Mr. Rodseth... FIRST, don't criticize the one who did show up to help you! It was not his /her fault the rest of the crew was not there. I personally want to give my "applause" to that ONE E.M.T. for showing up at your residence by their self. That is wonderful, not knowing what they were gonna walk in on to treat ALONE!!!! SECOND, why not volunteer yourself if you are that concerned about having to keep El Paso Resque Services number for future refence. ( they are always looking for help!) I know there has been many articles published telling all of us citizens about how short handed the squad is on help. THIRD.. I beleive you should contact the person from the Minonk squad that did show up to help you that day and " Thank" them, not run them into the ground for something they tried to do that day for YOU!!!! After all it has taken you 4 months to complain about this issue!!!!! I thought your editorial about the Cubs was great. I am also a Cubs fan, but a more recent one. I went to college last year at Columbia College Chicago, which is on South Michigan Avenue. As a matter of fact, I lived RIGHT next door to the Pacific Garden Mission that you talked about in your editorial. (we will save those stories for another time). My roommate was a huge Cubs fan, and her boyfriend was even more. He took two of my roommates and me to our first Cubs game this spring. We rode the "L" to Wrigleyville which was about a 20 minute ride from our apartment. It was a perfect night. The air was warm, the sky was clear and the season was just starting. They played the Milwauke Brewers, and unfortunately..lost. But even though they lost, the fans never gave up and had a great time just being there no matter what. Since that game I was able to go to one more this season about a month ago and my admiration for Cubs baseball is growing by the minute. I say, if there is anyone that hasn't gone to a Cubs game..you should go while you have a chance. There is nothing like it. Even if you don't like baseball...you will love the experience! On a Saturday during June this year at 10:00 in the morning I had an accident and called the Minonk Rescue Unit. They were not able to help me because they only had one guy on call and you need two to run it. What is up with that. I could see during the week maybe being short, but on a Saturday morning that is ridicules. So I had to call the Elpaso Rescue Unit. On the trip to the hospital the paramedic said they get called over here quite a bit now. I pay taxes for this service and should be able to use the service or get a refund on my taxes. It is about time the mayor got this situation under control. I do have high praise for the police deparment though. They were there with 3 minutes and kept me calm and comfortable while I waited for the Elpaso squad. Thank-you. At least somebody was doing there job right. In conclusion if I were you I would sure keep Elpaso Rescue Unit on your list of emergency numbers. You will probably need it. I am also an alum of M.D.R. and agree with most of what Keith Carlson said in his e-mail to Minonk Talk, except when he came to his point of "the wealthy farmer" making a substantial donation to keep extra curriculars afloat. As a tax paying citizen in this great school district, county, state, and nation I take exception to this statement. Why does Mr. Carlson think it needs to be a farmer that needs to come forth to save the day. He must not understand that on a whole the farmer, land owner (land lord) pay the biggest share of the tax load already. Yes, this year we have a great corn crop one of the best that I have ever raised in my 20 years of farming, but with the cost of production and the price we are paid for the crop there just is not very much profit left to give away. Mr. Carlson needs to walk a day in the shoes of a farmer especially on bill paying day, before he passes judgement on a class of people. Golden girls of 55 a misnomer? 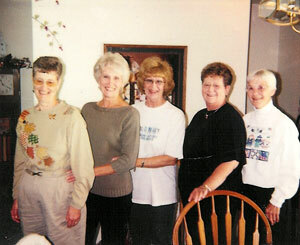 I take offence to titling the picture of the five women "The Golden Girls". Why, they are barely out of high school. I should know. I graduated the same year they did. Golden smacks of something old like the Golden Oldies. These five are far from that. They are part of the rock and roll crowd. I'll bet if you could see their feet they would have on black and white saddle shoes Just look at the youthful smiles on their faces. If the name 'The Golden Girls' sticks, others will be looking at some one like me with naturally white hair and start calling us The Silver Threads. We can't let this get out of hand. The picture title smacks of a Rush Limbaugh comment. I don't think we need an independent council set up to investigate. Why not call them The Wild Things or The Minors 55ers or The Rockeretts. Suggestions from anyone would be appreciated. If you see any of the five tell them how great it was to see their picture on MINONKTALK. You can tell how they felt about all this because they ended by saying "Don t call us; we'll call you". Now I'm going to have to wait for the phone to ring. Putting aside personal feelings regarding extra curricular activities, the question we, as Unit 6 citizens, need to ask is, "How can anyone decide what programs to cut when they do not have concrete figures as to what those programs cost?" I admit, I have not been to as many School Board meetings as I should, but whenever I do, I leave feeling like I just talked to people our Superintendent blames the problem on - state and federal officials. Rarely is a direct answer given. It is much easier to skirt the issue and offer to meet with that person individually. What's missing is accountability. We citizens want/need to know exactly what each program costs. Without that information, the Citizen's Advisory Committee is doomed for failure. Those of us who want to save the school district will, believe me. What we want in return is an administration we can believe in; one that we trust is truly concerned about our students entire education experience and not another bullet point on someone's resume. I sympathize with Mrs. Kalkwarf's disappointment in the Board of Education's decision to not fund extracurricular activities for the 2004-2005 school year. However, I feel there are some misconceptions about this Board decision that need to be clarified. The newly formed Citizens Advisory Committee (CAC) is just that, an advisory committee only. The members of the committee are the stakeholders in this process. They are the taxpayers, students and teachers of District 6. In other words, the Board is reaching out at the grass roots level to seek suggestions, ideas, options and advice on how to turn this situation around. All reasonable suggestions will be brought to the Board by a representative of the CAC for possible Board action. Ultimately the Board will make the tough calls. Also, in response to Mrs. Kalkwarf's belief that a "referendum will not pass unless the administration has exhausted all options....." I offer this response for clarification. I, too, have heard the same comment from individuals in the Fieldcrest District. The Board has already cut fifteen positions from the Budget, raised fees across the Board, reduced administrative expenditures, slashed supplies and materials and curtailed capital outlay. While land values (EAV) have declined, what little commercial and residential development that has occurred has been scuttled by more severe decreases in land value (District 6 is 61% farmland) and the influence of tax increment financing districts more commonly referred to as TIFs. The crux of the problem is that state revenues have sharply dropped off while expenditures have increased. The Illinois State Board of Education mandates rigid curricular guidelines. Unfortunately, non mandated activities and courses are not funded by state revenue. Extracurricular activities, advanced courses and other curriculum, such as agriculture are not mandated. In order to continue operating, District 6 must either cut programs or find new sources of revenues. Raising fees is only a short-term fix. Last year in order to make payroll, the Board issued $650,000 in tax anticipation warrants (TAWs) which means the District borrowed against this year's taxes. The District's payroll is $600,000 per month. That is for the Education Fund only. Another $350,000 in TAWs was also issued for the Building Fund, the District's second largest operating fund. Unfortunately, this is not the worst of it. In order to make ends meet this fiscal year (2003-2004) another $800,000 has to be found somewhere. This could be additional TAWs or Working Cash Bonds. The District started this fiscal year over $300,000 in debt in the Education Fund only; when you factor in borrowing the District is over $1,000,000 in debt. I can supply the specific figures to anyone who asks for them. A failed referendum last April asking for .90 cents would have stemmed the hemorrhaging of dollars, but the communities soundly defeated the proposition. District 6 will announce additional cuts by January, unfortunately the prospect of not touching sacred programs does not look good. At least $300,000 more in cuts will have to be made. Behind the scenes, the adminisration has released feasibility studies for consolidation with a nearby school district. District grade level configurations are also being studied. Co-oping sports and academics are other options being explored. And come this January the Board enters into negotiations with the Fieldcrest Education Association. We are at the point of tumbling off the cliff onto the Financial Watch List. We are currently on the Financial Early Warning List. The next step is ceding local control to the State. The blame does not lie with the Board or the Administration, but lies squarely in the lap of our illustrious legislators and the administration in Washington, D.C. When you have a few hours, read the congressional record and see what our leaders in Washington DC are doing to our public schools. You would be sorely amazed! I could write for hours on the travesties that have visited upon our nation's public schools beginning with the White House, but we are now in Minonk, Illinois and have to figure a way to preserve our schools, the heart of our communities. I have been a supporter of Fieldcrest school district since its formation. I worked in favor of the consolidation, as well as tax referendums because I truly believed it was the best decision for our family and the communities involved. It has not always been easy as I come from a farming community and have family in the farming profession who have not always shared my point of view. I get defensive when I hear people cut our school district down for this or that, because I believe Fieldcrest has the potential to become a great school district. I realize we are not alone in being faced with tough decisions concerning the future of our schools. I am disturbed in hearing 'all extra-curriculars will not be funded by our district next year, and it is up to the newly formed committee and the communities to decide if or how these programs will be executed. I am ready to do whatever I can to support these programs because I feel they play such a huge part in the development of our children. But at this point, it seems to me the administration is taking the easy way out in dumping the responsibility back on the parents, businesses and other supporters in the communities. My feeling, and what I have gotten from our community is that before people are going to dedicate themselves whole heartedly to this cause, they have to be first convinced our administration has effectively exhausted all options including, specific cuts, salaries and other money saving techniques (grants, etc..) whether popular or unpopular. I do not think we are to that point yet. I would guess very few of us have the knowledge or experience to hold an administrative position in a school district, but quite frankly- it is what they are educated in and hired for to do. It is hard to go door to door seeking to pass another referendum, or asking businesses for more money when even one who supports our district has little confidence in it's administration. I hear others blaming the school board's decisions for our district's problems, when in fact, they are people like you and me who are making decisions based upon the information they are being given from the administration. They are merely a reflection of their leadership. If the board wants to generate more community support, the community has to first be shown that we can believe in our administrative decisions. In closing, I understand assessed valuation of farm ground has dropped in value and our district is located in a predominately rural community, but we should remember that residential properties have continued to increase in value. I doubt this will continue if we do not have a good reason for families to move into or stay within our district. First of all there are far to many cry babies on "want to help positions" not have to be there situations.such as esda and the ambulance squad. I'm tired of hearing people belly ache about how and when someone finally voices there opinion about these two departments. I have seen these problems happen not once but many times. There are times when the county will page out as many as three times and finally call El Paso. What the heck do we need something like that? There are some good people on the squad, but someone needs to weed the lazy ones out. It probably would be a good idea to take some of these taxes and pay for a "good" fulltime squad. The city should have better ideas than gripe about trucks parking on the streets. Truck drivers make a living too and they sometimes can't sleep in their equipment outside of town all the time. And we pay a lot more taxes than many of these city employees. Also, what is going on with the police dept? Why are they scraping the bottom of the pot for help? There has got to be a better way of selecting officers. They really should do a more stringent background check because there are certain people that should not have that kind of authority with their background. If something is not done soon ,there might be some very bad problems within the city administration because I believe you should know the law and obey the law before you can enforce the law. It is getting to the point that maybe a monkey can do the same job maybe safer than some people. I am 58 years old ,and I will have to move from this area, because I am scared that if anything happens to me I will not make it to proper help because of this lax of a rescue squad. I have lived here for almost three years and I am ready to go. I have also seen my water bill jump 4 times in totals. Have in mind I live alone, do not wash clothes and seem to use water sparingly because you can't drink it without getting sick to your stomach. A taxpaying citizen should not be afraid of his or her police protection, ambulance responses and drinking water prices. Have you ever wondered why nothing has not been done about the junk yard next to the city hall? Some of the vehicles have no license plates, yet nothing is being done about removing them. The place is an eye sore. Just because you have a business does that mean you can make a junk yard out of your property. There are 3 other places in town that are doing the same thing. Instead of complaining about the mess that is left along the streets, why not clean up the junk yards. As you know, complaining at town meetings gets you no where. I believe this is why no one attends them. I was just reading your article on the vandalism done on the trees! I think it is horrible, I don't understand why some teenagers can't just leave things alone! I am also a teenager going to Fieldcrest High school. I'm involved with many extra-circular and do not vandalize. These people who are vandalizing are ruining things for those who don't vandalize, and I think it would be wrong, and unfair to those who behave and do the right thing to put on a ban of no loitering after 9:00 p.m. To me this is a social gathering time, a time to hang out with your friends. Minonk has no other place where we could go to do this at, so where would we go? Also after high school football and basketball games, everybody goes uptown and gets a pizza, or just talks to one another outside, and we wouldn't be able to do this if there was this "ban" put on us. I think there is a better solution; putting more police surveillance on the area I think would be a better idea. But putting a 9:00 p.m. ban on those who do the right thing and don't vandalize would just be wrong. Editor's reply: If vandalism continues to occur in the parking lot, I am suggesting a ban on loitering only in the parking lot after 9:00 p.m., not the whole town. Perhaps, peer pressure from the innocent kids will cause the vandals to cease reeking their havoc. I've been reading e-mails regarding the EMT situation in Minonk. Now, I have no criticism one way or the other. But, I DO think that you're doing a good job by posting e-mails whether or not they reflect short comings or the good things that happen there. I was an EMT member at my former work. We had many situations arise that called for unusual action. Chemical spills, worker injuries, and sickness were just a few of the emergencies that we had to handle. Being first responder is not an easy task. We had to go through tough training, everything from CPR to critical, life saving responses. But, first, you have to evaluate the call. Is it safe to go in for rescue? Will the EMT be in danger? If you don't at first evaluate, you could have more than one victim. These volunteers should be commended for their willingness to even do this. MinonkTalk is more than pretty pictures, bake sales, and good works. It's a site that causes people to think and respond, no matter what the content of the message is. I know this is one reason why you put this site up, and it's working! I have been reading "Minonk Talk" for only a few weeks, and I have come to the conclusion that most of the e-mails that are printed are to get people fired up. I suppose you will most likely receive many in response to Brad Rodseh's criticism of the Minonk Ambulance Squad. I am writing because I would like to respond to Mr. Rodseh's comments. Although it has been printed in the Woodford County Journal many times, apparently some people need to be reminded that the squad is a volunteer organization. I know this because my brother-in-law, and my sister-in-law are on the squad. You would not believe how many of our family functions are interrupted because of an emergency. My brother-in-law and sister-in-law respond to these immediately, sometimes whether they are "on call" or not. They are quick because they live a very short distance from the shed. Other members have a little further to drive. Yes, I realize that there have been times that the ambulance can't "roll" as quickly as people think that it should. However, when you have a volunteer ambulance squad, I think you should be thankful that they are able to respond at all. How would you and your family feel when your life is always planned around being "on call?" A member can't leave town when "on call," and has to drop all activity when a call comes in, regardless if they are in the middle of something or not! Do you know how many times my young nieces are shuffled off at a '"pagers" notice to people who can babysit, so their parents can deal with your emergency? Do you know that there have even been times when I get a call that my nieces are sitting in their parents car at your residence because their parents drove there to help you, so I have to drive there from Rutland to get my nieces and take them home with me so you can be helped! Now, I don't wear a pager, so I wonder how many calls have been missed because ambulance members cannot find babysitters? And, since the city does not provide daycare for members' children, those who are lucky enough to find someone to take their kids at a "pagers" notice, would have to pay for them out of their own pockets. People have busy lives, and what some members of this community aren't getting is that these members are NOT paid to be on call. This is NOT a job, but something that these people do to serve others. Other cities, like El Paso for instance, make it a priority to pay their ambulance members to be on call so they can assure that help is always available. The leaders of Minonk voted not to make this possible. (source:Woodford County Journal) People on the Ambulance Squad have to make a living too. They cannot sit around waiting for calls when they have to make money to support their families. Not everyone can work in town, and some who do cannot always leave their jobs. Therefore, whoever is available will answer calls. Did you know that some people on the squad have jobs that require them to work weekends? My family members do, and I also know that my family members would really love to having that "Monday through Friday 9-5 job," but that opportunity has not presented itself as of yet. So, instead of criticizing a volunteer organization, Mr. Rodseh, you should contact your mayor and other town board members! Tell them that you want your tax dollars to support a full time staff! I do not know how much your taxes are, but apparently the leaders in your town don't think that they are high enough to allow them to hire a few full time Ambulance personnel. (Or maybe they don't think it is important enough, you should find out.) Then, after you contact the mayor and board members, why don't you contact a squad member and inquire about volunteering! I know that they are always in need of caring people, and it is obvious that you care, or you wouldn't have taken the time to voice an opinion. (and, four months after your emergency I might add.) Yes, Mr. Rodseh, go to a board meeting and voice your opinion! And, until you do, I think you should look further into situations before you start criticizing people! In fact, many in this community should consider helping out as well. I challenge you to evaluate your schedules, and then, if you discover that you truly do not have the time to help; then be thankful that some people do, and don't criticize them. Remember, these people are taking time away from their families to help yours. Editor's note: All letters that are signed are displayed on this website, not just controversial ones. In response to Chris McKay's question about the non-funding of extracurricular activities, I feel well-qualified to speak on the subject. First, when the Board voted to not fund extracurricular activities for the 2004-2005 school year that means all activities not part of the regular curriculum which includes athletic and non-athletic activities. Unfortunately, FFA, yearbook and so on will not be funded unless another source of revenue is found. Music is an academic for which students receive credit for either band or chorus. Art at the high school is an elective and is part of the regular curriculum. I was wondering if anyone knows if the school board is only planning cutting Sports, Art, Music, and Student council. Or are they planning cutting everything including FFA, FHA, Honor Societies, Speech, Homecoming Dance, Prom, All Class Sponsored Activities, Yearbook, basically everything except the classes. You know if they keep any other activity at all it not fair to the student that get their activity cut. Hi, Dave...I enjoyed you piece on the Cubs, it brought back some memories for me, as well. We used to ride up to Wrigley on the "Dinky" or "Doddle-Bug" to watch the games..
As Dusty Baker said before the season started: "Why not us?" Heck yes, I think they can go all the way. I've been following the Cubs down here in Texas, watching the games on WGN, and reading about them on their web site and in the Tribune. Pitching! If it holds up, will win it for them...And, as a long-suffering Cub fan both in Illinois and now in Texas, I say "Let's Go Cubs!" The "Billygoat" curse has been lifted, so watch out Marlins!!!! My name is Lynnette Baker , I am a member of Minonk esda squad IV111. When I heard what sounded like a disaster ,since my pager is in for repair, I rushed to the city hall and was met by a new ambulance member who also did not have his pager on. We waited until the new fire truck pulled back into the building and asked why there wasn't a page sent out that this was not an emergency. We were told they would call all the fire dept and ambulance squad, and I was told they would call me if there was a tornado. I served this community for 7 years as an emt-d and my sister served as chief of the squad as an I-med. We on the ambulance and esda squad deserve a public apology from the fire dept. I enjoyed Albin Johnson's story about his link to the civil war. It's exciting to think that ones great great grandfather fought in our great civil conflict. That's not many generations from the people of today. My cousin Jim Swan's grandfather also fought in the war , which is something I ve often thought about. If we had been born just a little earlier we might have been marching in a straight line toward the cannon of our southern country men. Thank goodness we were spared. Benjamin Butler came home from the war to Washburn and so we got a dentist in Minonk whose son recalls the journey. It won't be long before these human interest stories will be lost except for sites like MINONKTALK who publishes and stores them. Albin, it was a great story and hopefully it will inspire others to get their recollections published on MINONKTALK before the experiences are lost to the millenniums. I am an alumni of Wenona High School (my dad and sister too) and my mother (Donna Onnen) and Aunt (Barb Gibson) are alumni's of MDR.....I am saddened to learn of the cuts to extracurricular activities - my friends and I were talking about "What would we have done after school without practice etc.?? I see that Fieldcrest spent nearly $160,000 on salaries? Isn't there a way to trim that...say have parents volunteer their time to coach etc? I am sure there are many experienced locals with great sports skills - we use to play MDR and Toluca (and they beat us most of the time) - there is a wealth of knowledge still around. Football- I understand, expensive and insurance - wow - put B-ball and baseball - the fields are there, the gym is there, the uniforms are there, the equipment is there... I hope some of this can be saved....between you and me - there has to be a wealthy farmer who can make a substantial donation. Thanks for the updates - I enjoy reading the Minonk website when I can!! I have a few questions for all the people who are, either quietly or openly, criticizing Michael Stagliano, our superintendent. Did you forget that he inherited this financial mess from the previous administrations and is not personally responsible for the problems in our school? Speaking of the old administration, did they foresee this deficit happening? Were they aware of the cuts that would have to be made and were perhaps afraid to "rock the boat" and thereby suffer the wrath of the community? Maybe their time in office was short-lived and, therefore, they did not concern themselves with the economic future since they would be gone when the hammer dropped. Maybe the answer would have been to start smaller cut-backs sooner, or maybe the fault should lie more with the meager funding the state is providing. Obviously, the citizens do not want a tax increase, so where is the answer? Do you have it? I don't have the solution, but it seems to me that anyone willing to take on this fiasco should have the support of the community. As for all you people out there that are so freely handing out the scorn, where would you make the cuts? Should we cut the curriculum, double the class size in order to eliminate teachers, dismiss all teachers aides, eliminate bus drivers, or maybe get rid of all maintenance and let the teachers do their work? These are pretty ridiculous suggestions, but if you have the answer, please apply for the superintendent's job - obviously you are smarter than Dr. Stagliano and you are over-qualified in your line of work! I am writing in response to talk of cutting the funding for extra-curricular programs at Fieldcrest. I would like to address two comments that disturbed me- the opinion that people will not want to move into this community if the schools do not have programs; and that kids will be bored, and become more prone to acts of vandalism. The whole purpose of sending your child to school is that your child will learn. I expect that my child will learn to read, write, learn math, computers, science, and to work well with others. I do not send my child to school for extra curricular activity. I am a parent who invests time into my children, as it is first and foremost, my responsibility. My children have a rich experience with their extra curricular activities now. They are involved in church, 4-H, Scouts, matial arts, swimming, and we play sports in the summer! That is the key word: WE. The organizations that my children belong to are wonderful. I get involved as well, and my life is enriched in the process. If extra curricular activities are cut, we will surivive. I think it is time to examine just WHY you are sending your child to school. It is not realistic to think that your child will become the next Larry Bird, Deion Sanders, or Mark McGwire because they are in sports. Look at the statistics of our school thus far. It is, however, more realistic to expect that your child will become a community leaders, or even a world leader because of his/her education. I think it is more important that our students do well in their studies. I am not against programs. I was in many extra-curricular activities in school and enjoyed them all. (Marching Band and Chorus were my favorites, and my experiences will always be remembered.) I sincerely wish that as my children grow older that they will have the opportunity to experience them as well; and I am willing to pay for them to be in these programs. I pay for their activities now. I do not believe that cutting corners in education to fund extra programs should occur. If programs can be kept without losing teachers, then that is wonderful. If not, then by all means lose the programs. It is morally wrong to demand that taxpayers pay higher taxes so extra curricular activities can be funded. People on fixed incomes shouldn't have to pay higher taxes so kids can play sports. If a parent wants their child in extra programs, then that parent should network and find a way to support that. I believe it is false to assume that people will not want to move into this community because we do not have sports. I think that most people place a higher value on what their child will be taught, rather than what they can play. I, for one, feel it is much more important that my children attend a school where education and morality is valued most.